There are two very distinct sides of Rolex. There’s the robust and sporty side with offerings such Submariners, Daytonas, and GMT-Masters for men, and there’s the ultra luxurious and gem-set timepieces in gold with diamonds for women. 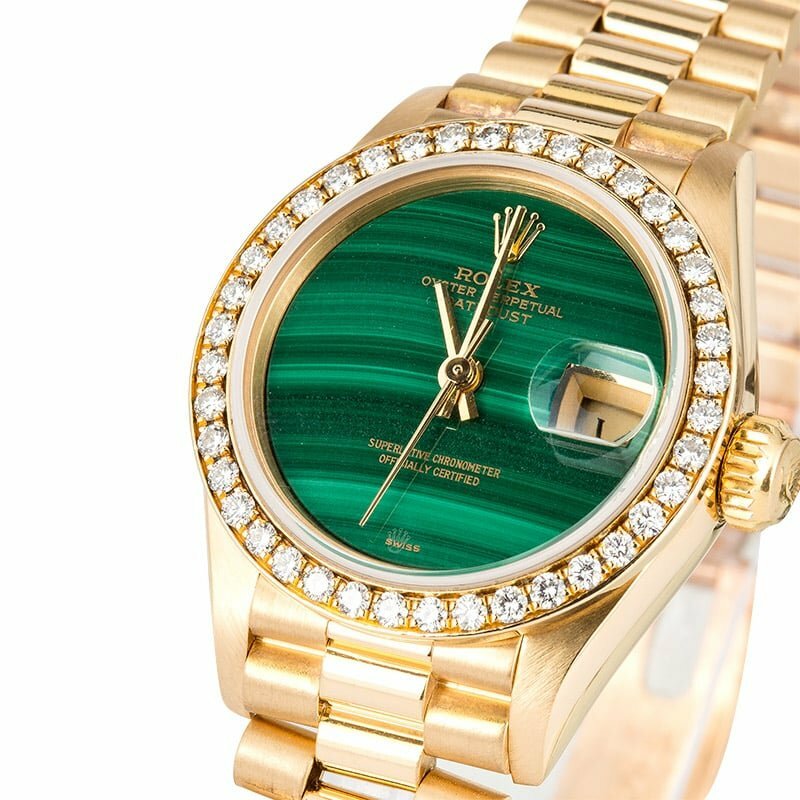 Here we take a look at a beautifully feminine Rolex watch that’s made all the more special with the addition of a green malachite dial. The ladies Datejust ref. 69138 dates back to 1989/1990 when interesting and colorful dials were especially in vogue. This particular 18k full yellow gold Datejust sports a delicate 26mm case that wears very elegantly on a small wrist. It is presented on a matching 18k yellow gold President bracelet, where the curvy three-link configuration wears like a piece of jewelry. Accentuating the jewelry appeal of the Lady Datejust ref. 69138 are the 40 fine white diamonds embellishing the bezel. For a distinct touch, this particular Lady Datejust ref. 69138 wears a green malachite dial. Not only prized for its rich color, but for its naturally occurring patterns too, malachite has always been a popular gemstone dating back to as early as ancient Egypt. 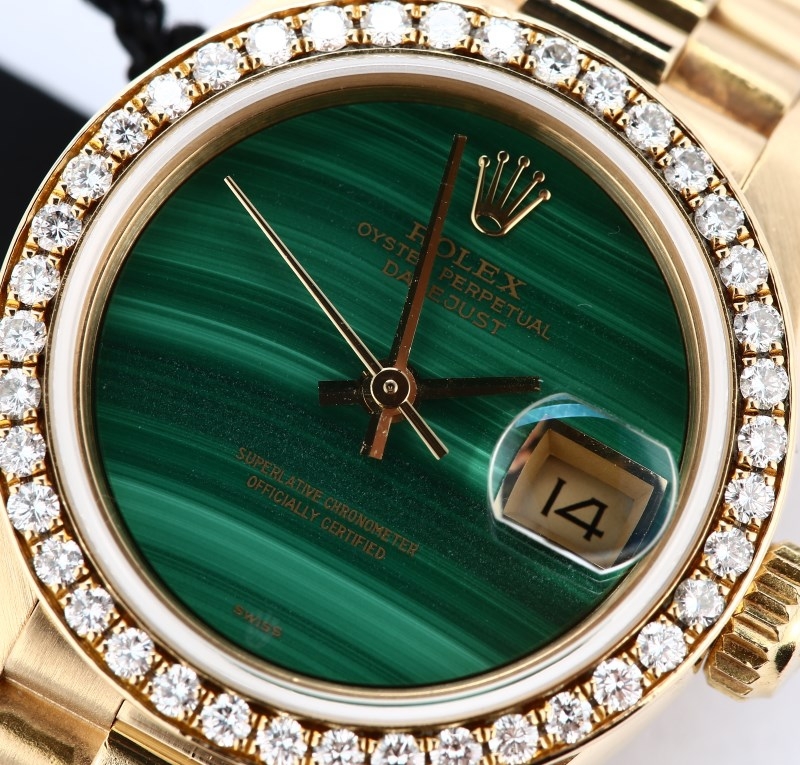 On the ladies President 69138, the differing shades of green forming a wave pattern on the dial is an exotic backdrop for the three gold hands, Rolex crown and text, and the date window at 3 o’clock — which is of course magnified by the Cyclops lens. The absence of hour markers allows all the attention to be focused on the captivating color and design of the malachite dial. The Lady Datejust ref. 69138 may be a bejeweled beauty, however, it does also feature the robustness we have come to expect from a Rolex watch. The Oyster case is outfitted with a screw-down winding crown and hermetically sealed fluted caseback to ensure waterproofness to 300 feet (100 meters). The face of the watch is protected by sapphire crystal, which is virtually scratchproof. 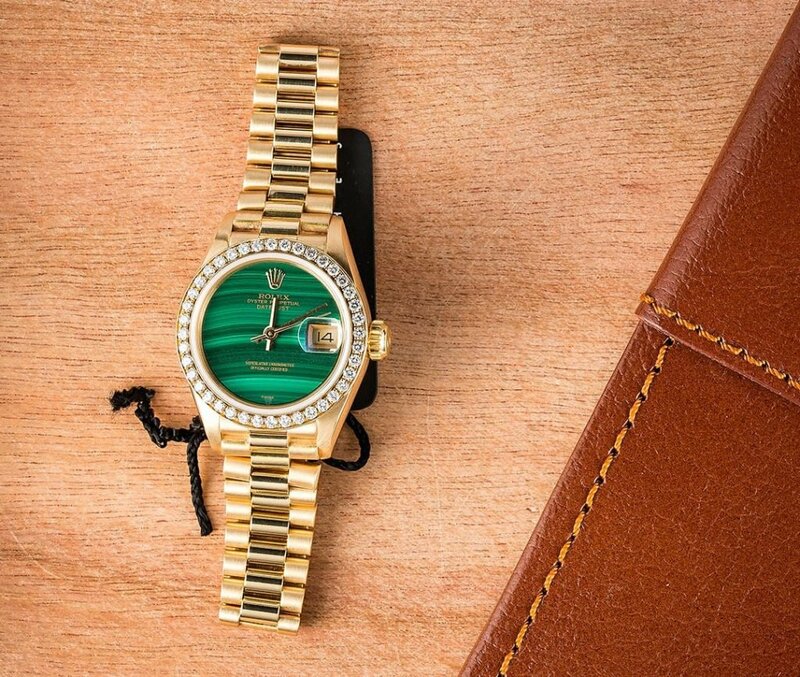 Beating at the heart of this Rolex Lady President with the green malachite dial is the Rolex Caliber 2135. As a Superlative Chronometer Officially Certified, the ref. 69138 has been officially certified by COSC, as well as undergone a battery of in-house tests by Rolex. The splendor on the outside of the Lady President 69138 is matched only by the technical mastery on the inside working to keep the watch reliable, precise, and accurate. It is widely speculated (it remains a speculation because Rolex famously never comments on sales figures) that the top selling model for Rolex is not their famous tool watches, but rather their Ladies Datejust timepieces. 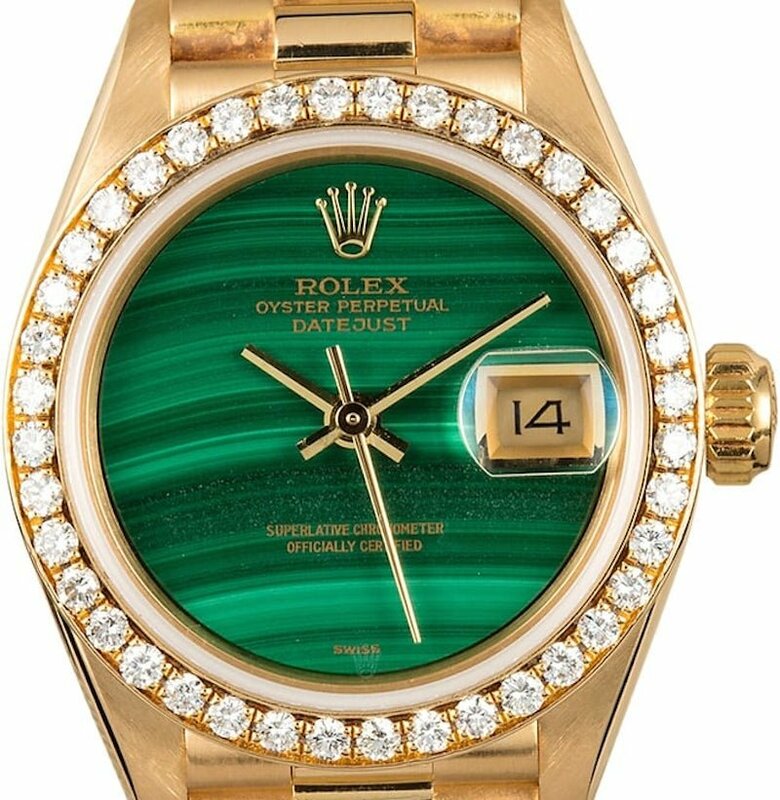 And when looking at a gorgeous example such as this yellow gold Lady Datejust President topped with a charming malachite dial and exquisite diamonds, it’s easy to understand why.